On Monday, the total crypto market sentiment dropped compared to last week, with the current average score being 5.18, comparing to last week’s 5.79 – the lowest it’s been in the last four weeks – according to Predicoin, a crypto market sentiment analysis service. 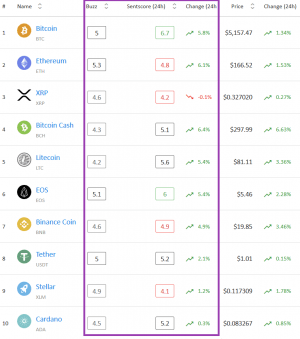 Out of the top 10 cryptocurrencies by market capitalization, Bitcoin remains undefeated at the very top of the list for the eight consecutive week at least, with a score of 6.7 (down from last week’s 7.1), while Stellar remains at the bottom with the lowest Sentscore of 4.1, down from 4.7. Only Bitcoin and EOS remain in the somewhat positive zone, and there are no coins in the negative range this Monday as well, after Predicoin adjusted its methodology (previously, 2 to 4.5 was considered as the somewhat negative zone). Interestingly, not a single coin saw a rise of their respective score. In terms of change over the course of the week, we can only talk about the biggest and smallest drops. Binance Coin saw the biggest drop with 11.7%, followed by XRP with 10.2% drop (after its 10.3% rise last week). Binance Coin’s technical side is weak with a score of 3.7, while it’s stronger in news with 5.6 and social with 5.5. Meanwhile, XRP has a strong social side with a high score of 6.5, followed by news at 5.9, and buzz at 5.7, but its weakest aspects remain technical at just 2.4 and fundamental at 4.4. Ethereum was last week’s biggest drop with 9.9%, but this week it saw the smallest decrease in score with 2.3%. 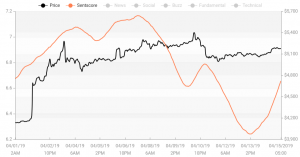 It has quite a few high scores: fundamental is at 6.5, buzz at 6.2, while social and news are both at 5.8. The weakest side is technical with the score of 3.8. EOS is right after Ethereum this week in the smallest drop category, with 4.9%. Unlike Ethereum, however, EOS earned all high scores: technical at 7, news at 6.6, buzz at 5.8, social at 5.6, and fundamental at 5.2.